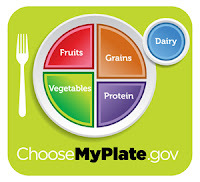 The USDA has retired the Food Guide Pyramid in place of a plate. In a fit of frustration I just threw the plate against the wall. I appreciate the plate’s simplicity as well as greater respect for diverse food choices. There appears to be more inclusion with less dichotomy (ok, still some good vs bad foods mentioned in the fine print yet less than the Pyramids). I would love to see a hunger/fullness/satiety scale at the bottom of the graphic. 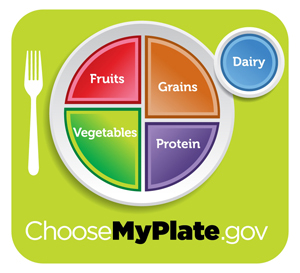 The plate graphic is followed by a few words of advice directing our food decisions. While learning to become a counselor, I picked up a valuable word tool: the conjunctions we choose to connect thoughts have powerful implications. In counseling, the conjunction and provides agreement and inclusion with positive connotations. The conjunction but has dire results: it negates the phrase before it. the government thinks we are not to be trusted. when enjoying food, sit tight: you’ve had too much. if you listen to your body, you will overeat. Even though obviously redundant, the USDA goes on to say, “Avoid oversized portions.” Just in case. Eat when experiencing hunger. Eat until your body is satisfied. Make time for meals. If you are part of a family, enjoy many meals together. Sit at the table to eat. Set a peaceful meal time environment that promotes mindful eating. Notice how you experience foods. Notice which help you feel stronger and more energized. Notice which foods make you feel more sluggish and sleepy. Let your body guide you toward nourishing foods.